Jianmenguan International Hotspring Hotel,Temple is located in the town of Jiange County, Guangyuan City,Sichuan Province, The mountain with water, an exquisite scenery.Convenient transportation,Across the road and the adjacent High-speed Rail Jianmeguan station，from the urban area of Guangyuan City, the Queen's 25 minutes, Panlong airport 15 minutes, the national 5A level scenic spot - Jianmen Pass 10 minutes,from Lanzhou Chongqing high-speed, Lanzhou Chongqing railway is only 5 minutes, Jingkun high-speed, 108 state line road, Baocheng railway passing through the city.Jianmenguan international Spring Hotel by Jiange Huayu Real Estate Development Co., Ltd. for $5 hundred million to build tourism The Grand Hotel. 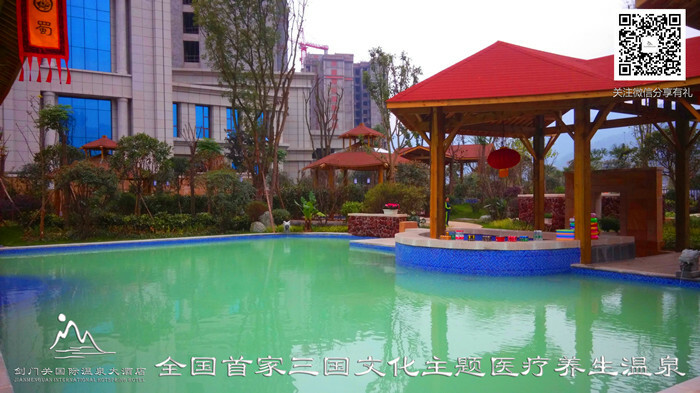 The total construction area of over 5 square meters, is a comprehensive set of hot spring bath, health care, leisure, entertainment, fishing in one of the five star Le Grand Large Hotel. With catering conference center, large shopping malls and hot spring bath center three building, room 348 (set). 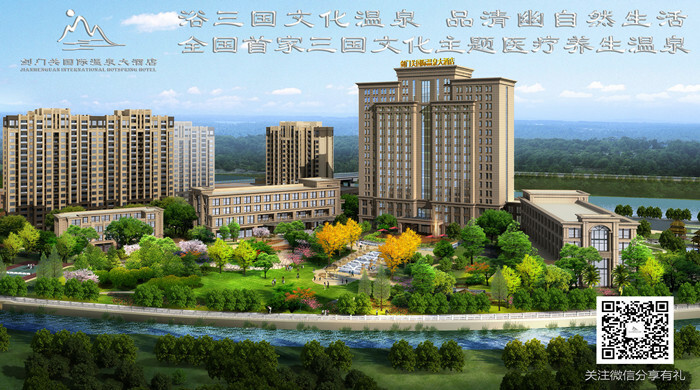 The 17 layer of the 80 metre high building luxurious solemn, grand and magnificent, hotel features modern simple European style as the theme, style is concise and rich modern feeling, is the landmark building of Jiange county. Jianmenguan hot spring, produced in the Qing Dynasty imperial temple town in Li Rong's hometown next Si Cun Ma Jia Gou, the water temperature of 50 ℃, the Provincial Department of land and resources and the relevant experts to identify authoritative Spa: temperature minerals content to meet the medical value and mineral water concentration standard. Name: containing boric acid, strontium metasilicate fluoride, hydrogen sulfide medical hot mineral water. 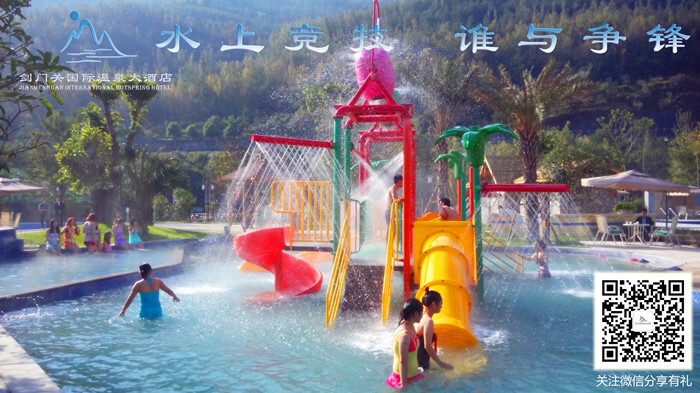 The hot spring water has a unique effect on the nervous system, digestive system, cardiovascular system and skin diseases, beauty, fitness. 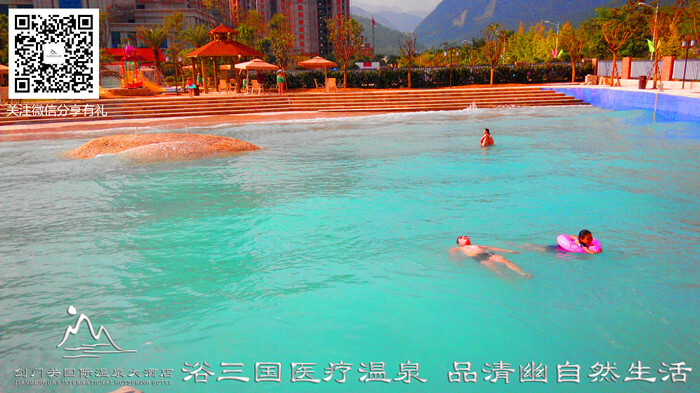 Hot spring center is provided with 24 Hot spring pool, can accommodate more than 2000 people hot soup. 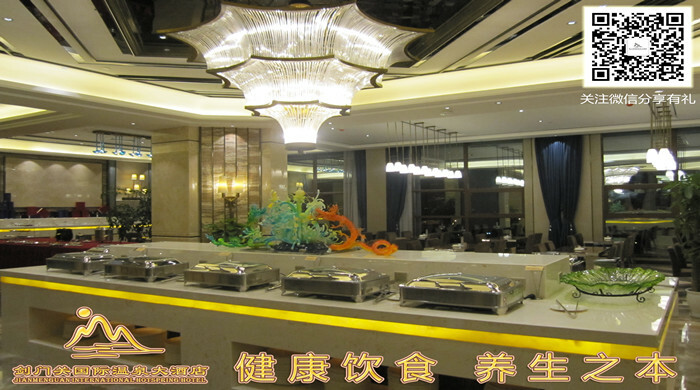 And rest hall, gymnasium, Internet bar, billiards room, video games center and buffet restaurant, KTV entertainment projects, physiotherapy and pure SPA therapy of traditional Chinese medicine. 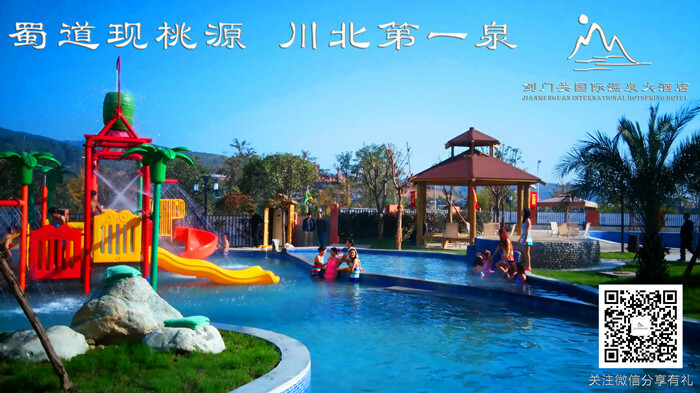 To provide a series of professional and family services, to meet the leisure, vacation, health care, health care demand. 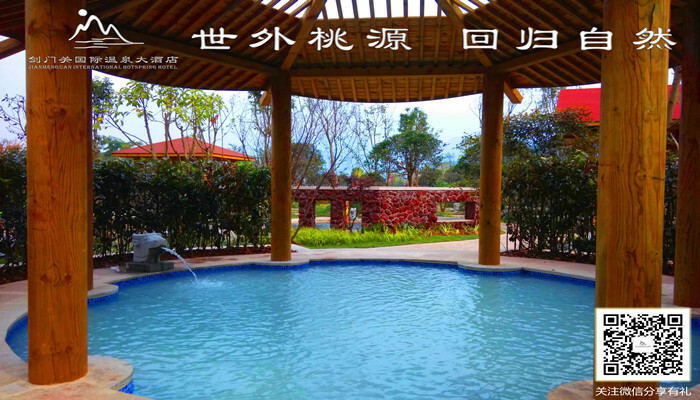 The Hotel has an independent hot spring villa, guest room facilities, hot spring home, really "hot springs into private". Beautiful mountains, clear water around the hotel, endless miles, freedom painted a poetic lithe and graceful leisure vacation picture scroll, Jianmenguan International Hotspring Hotel professional quality service, help you for business, leisure, happy, free and easy for you to taste everywhere in hot springs in the body and mind cheerful holiday, sublimation of leisure. The hotel has 348 rooms (sets) of high-grade comfortable and elegant guest room, porch design unique to fully take into account the guest's privacy, number of rooms and facilities are the best of Guangyuan, the room can provide the international, domestic long-distance direct dial phone, mini bar, satellite TV, independent bathroom, bathroom, room safe, broadband Internet access and other supporting services, facilities to provide the most comfortable, thoughtful, quick service for business and leisure travelers, make a guest to easily grasp the pulse of the world business in the comfortable leisure, and optionally connected world, is your business Holiday honor preferred. Thousands of people without column independent style banquet hall can meet more than 600 people dining at the same time, Chinese VIP rooms a fusion of traditional Western Sichuan folk elements and modern fashion sense, bearing good, privacy and openness of the perfect fusion, color, flavor and taste, and taste of Chinese and foreign north-south cuisine allows you to glut oneself with delicacies, let you enjoy the taste of the broad and profound Chinese diet culture. 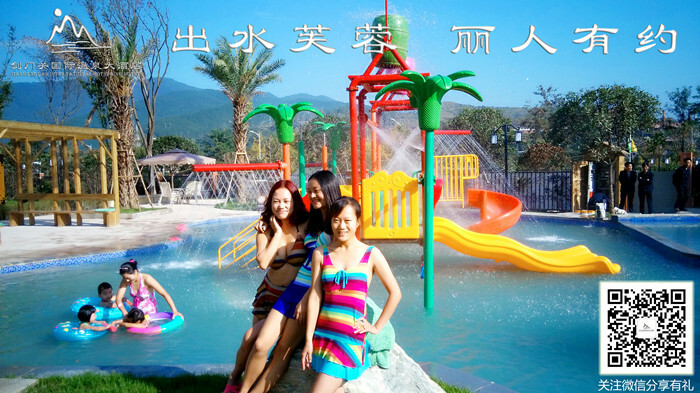 Is your business, the best choice of relatives and friends gather small. Big, in, small meeting hall can simultaneously satisfy the 500 conference reception, all rooms are equipped with advanced audio-visual equipment and wireless simultaneous interpretation system of six, can undertake a variety of large, small, meetings and social events, theme parties and banquets, let your business and leisure comfortable.